The acclaimed sci-fi drama from director Lars von Trier will take a bow on Blu-ray in March. 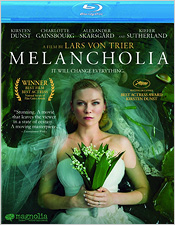 In an early announcement to retailers, Magnolia is working on 'Melancholia' for a Blu-ray release on March 13. The film stars Kirsten Dunst, Charlotte Gainsbourg, and Kiefer Sutherland, and was nominated for numerous awards including the Palme d'Or at the Cannes Film Festival where Kirsten Dunst won for Best Actress. Specs have yet to be revealed, but the Blu-ray will include: About Melancholia, The Universe, The Visual Style, Visual Effects, HDNet: A Look at Melancholia, and Theatrical Trailers. You can find the latest specs for 'Melancholia' linked from our Blu-ray Release Schedule, where it's indexed under March 13.